It almost sounds like the premise of a Michael J. Fox movie, circa Doc Hollywood. 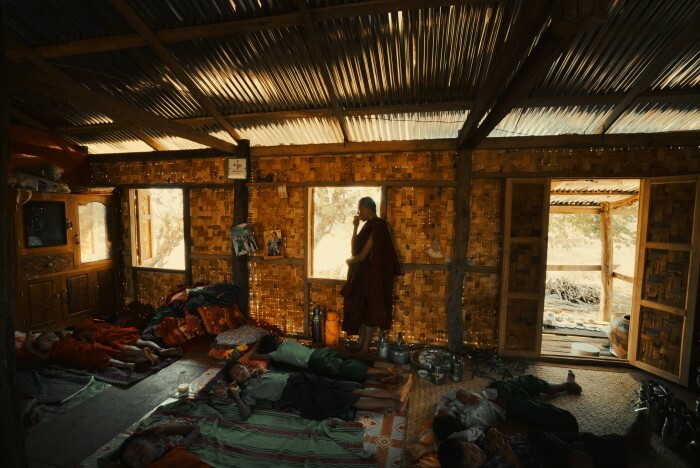 A fortune-teller told Wang Shin-hong’s mother that he should travel to an isolated monastery in central Burma, where he will live as a brother for fourteen days. He was also instructed to eat one apple each day to cure his insomnia, revive his sluggish business, and generally keep the doctor away. However, Wang will not find love in that hardscrabble community, as a rom-com character surely would. Instead, he gets an eye-opening lesson in what both the monks and villagers must do to survive in Midi Z’s 14 Apples (trailer here), which screens at the Freer as part of the mini-retrospective Borderlands: A Weekend with Midi Z. Why this monastery you or Wang might ask? Good question. It is never clear why the fortune teller was directed here specifically. Since it was a remote stretch of the country the Taiwan-based, Burma-born Midi Z had never visited, he decided to grab his camera and film his friend on his pseudo-pilgrimage. Arguably, this might have been the worst site for Wang’s retreat. Instead of training him in meditation and mindfulness, they put him to work collecting the considerable offerings freely given by the desperately poor villagers. He even starts serving as a community mediator. At this point, it is important to remember many, many Buddhist monks have endured beatings and even sacrificed their lives for the cause of democracy in Burma. On the other hand, it is not uncommon for the slacker children of middle class families in Southeast Asia to gravitate towards monastic life—a phenomenon depicted in the Thai mystery, Mindfulness and Murder. There seems to be a bit of the latter going on here. Indeed, the already quite worldly Wang shows signs of further disillusionment during his stay, but he also clearly understands the monks must do what they need to do to survive. 14 Apples is a straight-up doc, but it shares obvious stylistic and thematic commonalities with Midi Z’s previous films, in which the border between documentary and narrative fiction has always been rather porous. It also reflects his interests in migration and statelessness, especially when we learn how many villagers are living and working illegally in China, Singapore, and other more economically vibrant Asian nations. There are some telling moments in 14 Apples, but there are also times when the long-takes feel like padding. Frankly, it might have worked better as a thirty or forty-minute short film rather than a full feature, even though the pacing and aesthetics are exactly what the filmmaker’s admirers will expect. Regardless, those fascinated by monasticism should appreciate the very different perspective the film provides (this comes from a whole different universe than Into Great Silence). On a positive note, it is also encouraging that Z could film rather openly in Burma and not have to take extraordinary measures to smuggle out the footage (in contrast to his experience making Return to Burma). 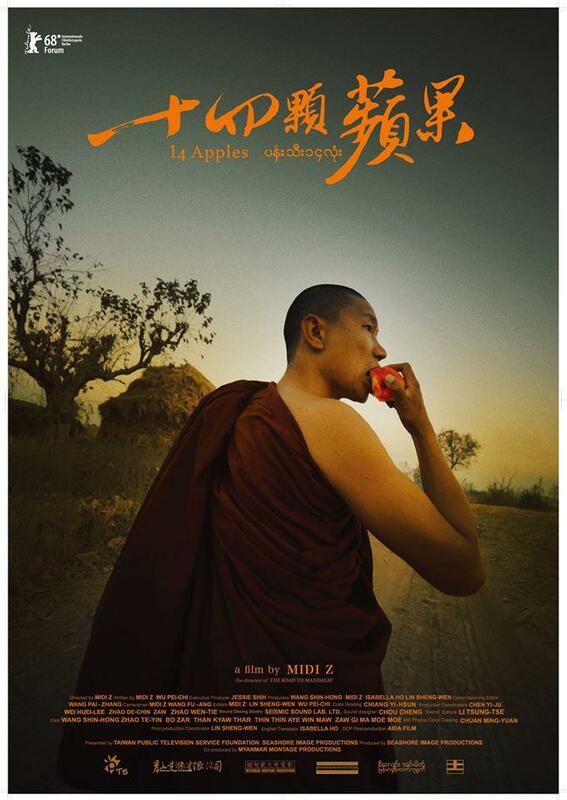 Recommended for cineastes with a personal interest in Burmese cinema and Buddhist monasticism, 14 Apples screens tomorrow (6/10) at the Smithsonian’s Freer Gallery, as part of their Midi Z film series.